After 13 years of running a VA business, I’m lucky enough to have developed a pretty accurate gut feeling about most new clients, but what if you’re fairly new to being a VA? Having read the same sort of issue time and time again in online VA groups recently, I’m going to share what I have learnt are some of the early warning signs – the types of behaviour that help predict which clients will turn into a drain on your time and resources. Now I’m all for a negotiation – if a potential client may be bringing you 50 hours a month, you’d be silly to turn them away for the sake of a small discount. But if you’re dealing with someone who can’t, and won’t, see the value you offer, that’s a different matter. From the ‘I can get cheaper elsewhere’ or ‘I don’t want to be tied into a retainer package’ right through to the frankly rude ‘You’re too expensive’… initial conversations like this should be ringing alarm bells that you’re about to embark on a stressful relationship. This type of client often turns into the type who complains, won’t pay and causes you sleepless nights. One more piece of advice here though – if you’re attracting a number of people who are questioning your rate, you‘ve probably got your marketing wrong. Don’t be afraid to re-visit your client avatar and review who your target client is. 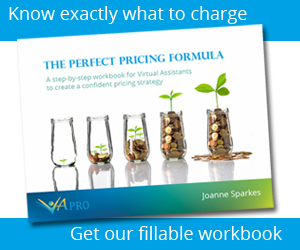 If a new client has worked with several VAs before, you might be reassured that they ‘get’ the way you work. Take care though as there are a small group of clients out there who move from VA to VA at a fast rate of knots, blaming each one for the failure of the working relationship or the latest project. Now I’m generalising here and of course, there are clients who just need a new VA or are looking for a different skill set. But proceed with extreme caution if they start badmouthing their previous VA – in a few months’ time, this could be you they’re talking about to someone else. These clients tend to be the sort who fall out with many suppliers, switching constantly and blaming as they go. Even if you’re in favour, it’s hard work when you’re dealing with the fall out from their disputes and the last thing you want is to be caught in the crossfire. I know a VA who recently changed careers when this type of behaviour got too much – that saddens me greatly, so protect yourself by recognising the warning signs early on. In my own VA business, we’ve had an increasing number of requests from potential clients asking us to send over multiple CVs so they can pick a VA. If you have a team of VAs in your business like I do, you’ll know that considering which VA to assign is based on the type of job, the skills of the VA and their availability. Yet these potential clients are often very cagey about the type of work and how many hours they need. So, are they likely to commit? In my experience, the answer is usually no, so always put the ball back into their court by asking for more details on the work involved. If they can’t trust your judgement on who to assign to them, it doesn’t bode well for your future working together. We’ve also heard several reports of recruitment agencies trying to gather CVs this way for EA and PA roles, so you might want to think about how you’ll ensure your team aren’t approached in this underhand way. Now it might sound strange but there are some clients who start off keen then suddenly won’t take your calls and never return them. You find yourself struggling to get them to sign the client agreement and you can’t even get started as they haven’t given you the log in details you need to do the job. It’s easy to excuse this type of behaviour – after all, our businesses exist to help people who are looking for a VA because they are so busy. But when does it stop being reasonable and start to be a problem? In my book, if you’re constantly chasing a client before they even sign the agreement, they’re going to be hard work. I always make it clear that there needs to be an investment of time up front to get the working relationship off to a good start. It’s vital you communicate well and have a clear idea of what’s needed if you’re going to be working closely together. This means the client making time to delegate and pass on the knowledge that they have in their head. Without this, it’s just never going to work. You can’t deliver if you don’t have a clear view of what’s expected. We all procrastinate from time to time (I know I do!) but it can become a major issue if it’s a client doing it, so I’m always on the lookout for those tell-tale signs such as obvious disorganisation and missing pre-arranged calls. Let me say here that I know there may be a genuine reason for a client missing an initial call so I’m always sympathetic on the first couple of occasions as I’m sure you are. After all, life is busy and things crop up, especially if you’re self-employed or have a family. However, experience tells me that unless there is a good reason, this type of client turns into one who keeps you hanging around. The sort who are always making desperate calls late on a Friday afternoon and expect a weekend turnaround at the weekday price. I’m afraid if it starts out like this, it’s how things are likely to carry on. And I know this because I learnt the hard way. One of my first clients would set out for the station and text on the way saying she’d be there in 10 minutes and could I make sure her ticket was booked for her to collect. If I was free, I’d book it but it wasn’t so great if I was in the middle of a call with another client. Not setting some working guidelines from the start meant hours of hanging around waiting for her calls and then missing things arranged in my free time to get the work done. I realise now I’d have had a far better return by using the time to market my business and find other clients. Procrastinators are definitely the type of client you can do without! Sometimes you can’t put your finger on it, but you just know that something’s not right. We’re all different and should embrace our individuality, of course we should. However as a general rule of thumb there will be commonalities across all of your clients – their business sector, their mindset, their communication style, their behaviour. So when someone comes along who stands out for whatever reason, you try to be open-minded. You give them the benefit of the doubt. You try not to judge. Your gut is screaming ‘DON’T DO IT!’ But you just can’t think of a rational reason not to go ahead. An obvious example of this of course is the recent ‘oddball’ who has been contacting multiple VAs giving fictitious details and explaining that he ‘works in the adult industry’. His behaviour was sufficiently peculiar to cause unrest amongst many VAs who he targeted. Unfortunately some are less obvious than this and not as easy to spot. So those are the top six clients to avoid in my experience. Hopefully you’ll save yourself time, money and stress by being able to spot the signs early on. My best advice is to trust your gut instinct and always learn from experience. I know there’s always the worry in the first few years that any client is better than no client, but always think of the cost to your free time and health, as well as the financial side. Remember, you don’t need a reason. You’re the boss. You call the shots. If it doesn’t feel right, don’t go there. I’ll end on a positive note by saying, as I’m sure you know from your own business, that the majority of my clients turn out to be fabulous. We all have our quirks so I never like to be too quick to judge. And I’m thankful that being a VA has one big positive over a regular job – it’s entirely up to us who we choose to work with. I’m definitely on of those! hehe. Great article and great read! Got to get out of that habit to be more productive on my end!